Caraway seed has long been used, whole or ground, in northern European and other world cuisines. In the text book Handbook of Spices, Seasonings, and Flavorings, the author reports that the use of caraway goes back at least 5,000 years to Mesopotamia. The name caraway comes from the Arabic karawya. Asian cultures refer to it as “foreign cumin” because of its resemblance in appearance and flavor to cumin. In ancient Roman, cooks seasoned sausages with caraway seeds. Hungarians flavored their famous goulash with caraway. These days, most of us associate caraway with popular German and Austrian rye bread recipes. This fragrant ingredient contains oil with strong anti-fungal and anti-yeast properties. Simmered with milk and honey, caraway as been used as a remedy for colic. 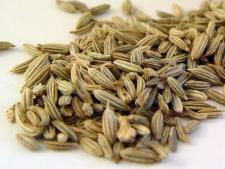 A tea made from caraway seed has been used as a remedy for loss of appetite and digestive disorders. It has also been used to treat gallbladder spasms and menstrual cramps. In addition, caraway seed is used as a ingredient in body care products and cosmetics. Caraway seed can also be employed in tinctures, infusions, and encapsulations .